A five-ton rope offers the challenges in Yonabaru this weekend, while muscle power is also the order of the day at Nago City’s Dragon Boat races. The two-day Yonabaru Festival begins Saturday with traditional summer music, dance and plenty of food, while a 400-year tradition is continued Sunday afternoon with a Tug-of-War. The 26th Annual Yonabaru Tug-of-War is mostly for fun, a far cry from historical times when residents used the tug-of-war festival to chase the evil spirits away and to give thanks for bountiful harvests. While powerful drums pound and bells are rung to stir up the festival crowd, two huge sections of rope—one male, one female—are tied together, ready for East and West teams to begin competition. Traditionally, the winning team is said to be set for a year of good fortune. 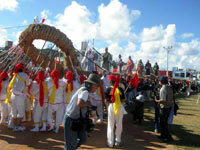 The 90-meter rope, five tons of straw woven together, is first carried to the city center for the tug-of-war. Once over, pieces of rope are hacked away and taken home by participants and spectators as a sign of good luck Yonabaru residents believe will symbolize business prosperity, welfare of the household and perfect health in the year ahead. 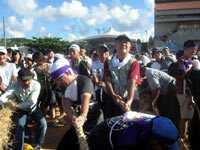 Sponsored by the Yonabaru Town Society of Commerce and Industry, the tug-of-war is open to everyone age 20 or older. People wanting to participate should register at the festival site beginning at 2 p.m. Sunday. All registered participants will receive Yonabaru Festival original tee shirts presented by Coca Cola, Orion Beer and Masahiro Awamori, the festival sponsors. Following the tug-of-war, three popular local characters inspired by Yonabaru’s specialty products, the Yonabaru Fighter 3 Show, will perform on stage at 6:30 p.m.
Organizers say there’s plenty of parking available, and plenty of excitement to be had. Information is available from the Yonabaru Festival Steering Committee, (098) 945-2201, or the Yonabaru Town Society of Commerce and Industry, (098) 945-3513. To the north, Nago City is hosting the 30th Nago City Mayor’s Cup Dragon Boat Race, often billed as the national championship of dragon boat races. 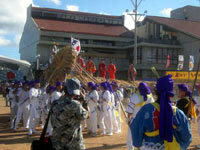 The race draws the most entries of all Haari tournaments in Okinawa, with entries coming from mainland Japan and overseas, as well as Okinawa. Sunday’s race comes on the final day of the Nago Summer Festival, and is considered special because it’s the de facto finale of Okinawa’s Haari season. The races take place at Nago City Port. Take the Okinawa Expressway to the northern terminus, Kyodo, then proceed north on Highway 58 into Nago City. Signs to Nago Port and the festival are clearly marked.